*This review contains no real spoilers as far as we can spot — only facts already known or implied by film publicity. Nonetheless, please read with precaution if you wish to know as little as possible about Star Wars: The Force Awakens. For a totally spoiler-free preview, read our feature here. The sequel to the original Star Wars trilogy — set 30 years after the events following the demise of Darth Vader and the Empire — comes 32 years after Return of the Jedi (Episode VI) and ten and a half years after the last Star Wars prequel film, Revenge of the Sith (Episode III). To me, this is the first real Star Wars movie in 32 years. In Star Wars: The Force Awakens, there is no new comical entity akin to Jar Jar Binks. Yes! No melodramatic exclamation such as “Nooooooooooo…” from a villain. Yes! No incredulous situation where a character does the impossible — such as a very pregnant Amidala practically skipping around. Yes! OK, I’m sold. But, seriously, The Force Awakens rekindles and further fans the flames of passion for the Star Wars saga with good ol’ no-nonsense storytelling and excellent dialogue. Finally, a worthy successor to the original Star Wars trilogy, for a new generation of fans. I know what I’m saying is pretty strong, especially to the newer fans of Star Wars (of the prequel movies and “Star Wars: The Clone Wars” and “Star Wars: Rebels” TV series). Let me briefly qualify my view. Among my biggest gripes about the prequels (The Phantom Menace, Attack of the Clones and Revenge of the Sith) are the poor storylines and lack of quality or memorable dialogue, of which the original movie trilogy was chock-full. Thank goodness The Force Awakens has remedied these. Many a time during the premiere screening, the audience snorted, guffawed or grinned to themselves, and often because of the characters’ quips or interactions with one another. This is character fleshing and development — what any good movie should have! Poe Dameron is the best pilot in the galaxy, and his interaction with Finn is both interesting and amusing. I was particularly amused by the following exchange. More than the dialogue, there were a few themes that added depth and meaning to the movie, including those of family, conscience and self-sacrificing love. I am almost convinced that The Force or Jedi-sm should be an official religion (or is a reflection of prominent religions today). These moments were greeted with hoots and cheers (and goosebumps) during the premiere. Apart from Solo and Chewie (reprised by Harrison Ford and Peter Mayhew), fans will also be elated that some of the original characters and cast return to the series, such as C-3PO (Anthony Daniels), R2-D2 (Kenny Baker), Admiral Ackbar (Tim Rose), Nien Nunb (Mike Quinn) and Princess — now known as General — Leia (Carrie Fisher). The most poignant appearance would be that of former protagonist Luke Skywalker (Mark Hamill), who’s now a wizened Jedi Master. I’ll leave it to you to discover how that scene happens. You can be certain I LOL-ed. Kylo Ren is already the most popular new character, with many fans dressing up as him. There is also much for yet another new generation of Star Wars fans or the old ones looking for a renaissance to be thrilled about. Daisy Ridley, Adam Driver and John Boyega were excellent choices and portrayed their roles of the new protagonists with much aplomb. It is highly challenging to express multiple and conflicting emotions in complex characters (and to have whole legions of Star Wars fans critiquing your every expression) but they deserve much credit for their admirable performances. I also love how the new characters and their stories are interwoven with the old, and into the fabric of The Force, carrying the saga into uncharted (or yet to be revealed) space for new generations. I can’t help but feel that no other movie saga or (continuing) story will ever come close to the magnitude and trans-generational reach of the Star Wars films. While the question of Rey’s identity is not fully addressed in The Force Awakens, valuable nuggets are revealed. When Rey is asked, “Who are you?” she responds, “I’m no one.” As already evidenced in the trailers, we know this is quite the opposite — she is someone of vital importance to the new storyline. But just who is she? While The Force Awakens does reveal her capabilities and some enticing nuggets about her, who exactly she is and what mantle she’ll eventually take on is not fully nor clearly answered in The Force Awakens. What a relief! There is much more for us to look forward to in Episode VIII and IX. Fans of The Force Awakens will be keen to find out what happens to some of the new characters, including where does Kylo Ren, or Finn, for that matter, go from here? Where does Finn go from the end of the film? Will he grow in The Force? Another question that is yet to be answered is, is Finn force-sensitive? Does he have the potential or capability to become a Jedi? We already know from the trailers and posters that Finn does at some point carry a lightsaber and uses it (albeit in somewhat crude and unskilled fashion) in The Force Awakens. Will we have several new Jedis in the near future? Wow, the prospect of that! OK, OK, I shall control the fanboy in me and not count my Jedis before they’re batched. When the applause and fanfare subsided as the credits rolled on, I only had one thought in my mind: How long will I have to wait for the next one? 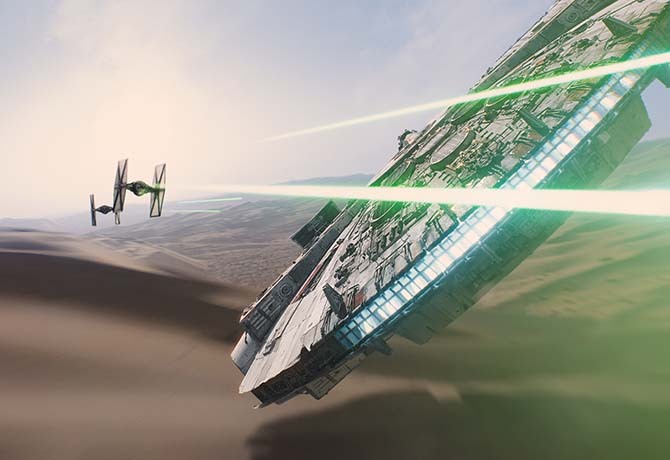 Star Wars: Episode VII — The Force Awakens premiered this week and is now in cinemas.